my students engaged/entertained these last few weeks of school. My students are sooo done with school and I *ahem* amdonewithschool, too. My Problem: I am finding it difficult to engage my students and keep them with me. My Solution: Make school incredibly, wonderfully fun. school can still be a bit challenging at this point in the year. Just in case you are having this same problem too, I thought I might share some of the things we have been doing in our classroom to... ummm... well... ya know... pass the time! Last week we did some fun friendship building activities, since they will all be in the same class next year. 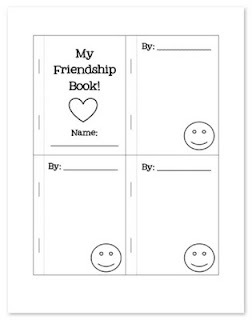 We made Friendship Books (and you can too, by clicking here). After they assembled their books, they passed it to another classmate. I turned on some classical music and gave them a minute or two to write a nice compliment to the owner of the book. We continued to pass the books until every page was filled in. My students loved reading all the wonderful compliments from their friends and I am sure yours will, too! You can download a copy of the book for FREE at my TpT store by clicking the picture below! Diet Coke and Mentos Geyser (thanks for the idea Sydney) and Dancing Raisins. What fun things are you doing to... ummm... pass the time?